The Color of Pomegranates tells the story of Armenian 18th century poet and national icon Sayat-Nova, but this is a biopic with a difference! Utterly uninterested in simply chronicling documented incidents in Sayat-Nova's life, this is a film steeped in legends, folk tales, sorcery and symbolism. 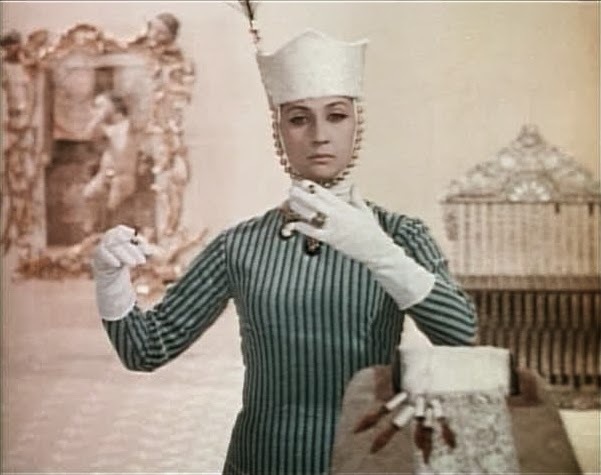 Director Sergei Parajanov chucks out traditional storytelling in favor of a dreamlike representation of the stages of the artist's life. Fantastic static tableaux of figures, books, carpets, statues, mirrors and animals transport us into the surreal beauty, imagination and other-worldliness of Sayat-Nova's life and work, even as the facts and meaning escape us. The densely composed earth-tone images are punctuated by quotes from the poet's work. This is a love-it-or-hate-it work, uncompromisingly experimental and uniquely visionary. It's largely allegorical coming-of-age arc, oft-infuriating intellectual rigor and shocking bursts of creative genius remind me in odd ways of A Portrait of an Artist as a Young Man (a work that I found much harder to like). 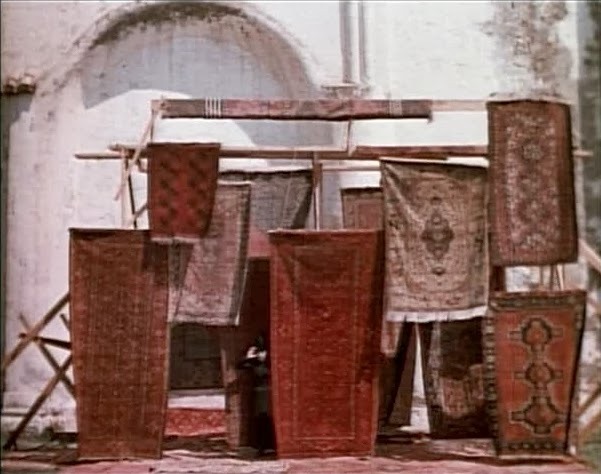 The Color of Pomegranates feels, at times, totally resistant to interpretation, but it never insists you take it literally and, more often than not, it politely invites you to enjoy it on a purely sensory level. Yet in the aggregate it is easy enough to follow its philosophical and spiritual sense, especially its belief that an artist's talent transcends his physical materials. 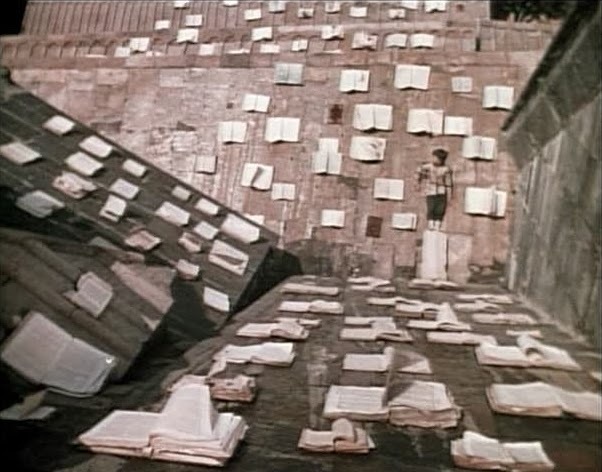 Parajanov and Sayat-Nova come together to worship color, contrast, form and balance. Universal as these abstracts are, they are here infused with Armenian culture, history, religion, architecture, dress and cuisine to create a homage as much to a place and a people as to a single poet and his poems. 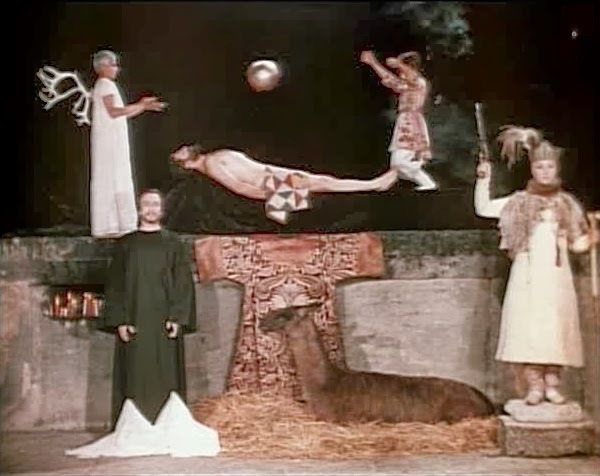 Though never a popular or financial success outside of Armenia, The Color of Pomegranates quickly found fans in the art house community, influencing directors as varied as Fellini, Scorsese, Tarr, Antonioni, Godard, Greenaway and Angelopoulos. In his day, the Soviet authorities never knew what to make of Parajanov and his eccentric, perverse and 'potentially dangerous' films, so they arrested him several times and imprisoned him for years at a stretch. Though this failed to sap his creative energy it did slow his cinematic output and caused him to temporarily switch mediums: he made a museum-worth of collages and assemblages from the limited materials supplied to his cell. This sounds awesome, and I'm not just saying that because you referenced James Joyce. Also, yes, I am in fact reading these. Yay! Brothers must stay together!